BOSTON – We all know how well the Brits do the standard murder mystery. They have fed us a steady diet of the genre through the BBC for decades. But what if a rather iffy British theater troupe – one so bereft that it had to produce Chekhov’s “Two Sisters” or the musical “Cat” – took on such a show, with limited resources. And what if everything that could go wrong did go wrong? What would that look like? You don’t have to wonder anymore. That’s the whole idea of The Mischief Theatre’s production of “The Play That Goes Wrong” now at the Emerson Colonial Theatre. This touring production arrives with serious credentials, including the 2015 Olivier Award for Best New Comedy, and an 18-month ongoing run on Broadway. Before the show begins, actors and stagehands are wandering about the theater an the stage, making repairs to the English manor drawing room set designed by Nigel Hook which will quickly become a House of Horrors. Farce is a delicate balance and it can easily go off the rails. But the premise of stiff-upper-lip Brits soldiering on no matter which actors go down, which prop is either missing or not working, and which walls are falling down all around them is so convincingly portrayed and acted that “The Play That Goes Wrong” holds together well even when all is pretty much lost. Director Matt DiCarlo and writers Henry Lewis, Jonathan Sayer, and Henry Shields delight in littering the set with potential time bombs, including an elevator to a second-floor study, a study that seems tenuously supported at best, and a sound and light board operator who seems preoccupied with eating. A murder has been committed, and soon the corpse of murder victim Jonathan Haversham (Yaegel T. Welch) – killed during his own engagement party in the drawing room – will be moving voluntarily and involuntarily in a hilarious variety of ways. This piece is very much a cousin to Michael Frayn’s “Noises Off,” the gold standard of this genre, which told the tale in a different fashion – from a backstage view – but where chaos also reigned. The writers have also lovingly but effectively poked fun at the murder mystery genre itself, fashioning stereotypical theatrical “types” that almost anyone who has trod the boards will recognize, such as the unbearably hammy, pleased-with-himself Ned Noyes as Cecil Haversham and the manor’s aged gardener, Arthur. Jamie Ann Romero is the vampy Florence Colleymore, Charles’ fiancee, understandably “hysterical” at his death. It turns out, though, she has actually been having an affair with Cecil. Peyton Crim is Florence’s brother Thomas, whose life is constantly being endangered by things such as phone lines and a collapsing study. Called in to untangle the mess is the intrepid Inspector Carter (Smith in a dual role) who will prove inept at solving the crime but excellent at missing clues and being completely incompetent. There will be a second murder, more crawling corpses, and things will, incredibly enough, continue to go downhill. The piece does repeat some gags over and over. The character of Florence is folded, spindled and mutilated – something like the exploding drummers in the mockumentary “This is Spinal Tap” – but she keeps bouncing back for more. Scott Cote, playing the butler Perkins, will make it a habit of completely mangling words and rendering them unrecognizable. 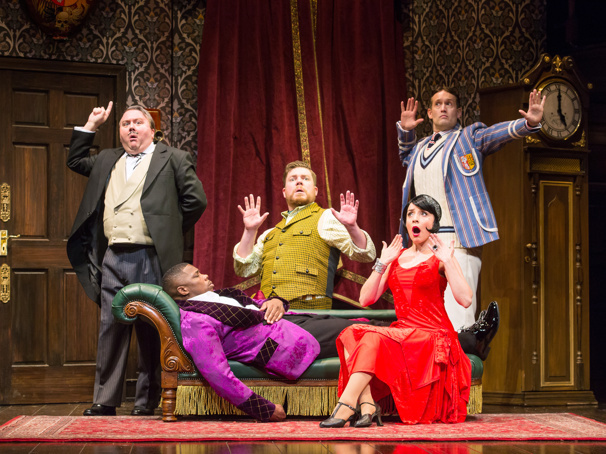 Still, if pratfalls, mishaps, and chaos are your game, “The Play That Goes Wrong” presents them artfully, and, by the end, those stiff upper lips on stage are starting to quiver.